Is it time for the bears to come out from the woods? Apparently so, judging by the last 48 hours’ price action and the general tone of comments in this space. To be sure, yesterday’s price action was pretty dreadful. Equities and other risk assets tried to rally, and had a modcium of an excuse to do so in the claims and house price data, but fell back to earth with a resounding thud. 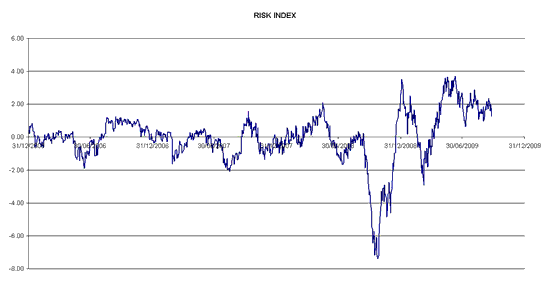 What’s interesting is that Macro Man’s proprietary measure of risk appetite, while well below the highs reached earlier this year, remains at levels consistent with, dare we say, irrational exuberance by the standards of the pre-crisis era. As for the whys and wherefores of the sell-off, there are two plausible explanations for yesterday’s price action. The first, more prosaic, rationale was the disappointing existing home sales data, which fits the sort of brown-shoots scenario described yesterday. The alternative, sexier explanation was the Fed’s announcement that it is reducing the size of the TALF/TAF programs, and the simultaneous releases from the ECB/BOE/SNB that they will be winding down some of their special USD repo facilities. Now, all of these programs have been under-utilized in recent months, so their withdrawal should not have a particularly pernicious effect, especially as the authorities have retained flexibility to re-establish them. But one might reasonably posit that winding down unused facilities is a necessary (if not sufficient) precursor to implementing an exit strategy; while their elimination does not suggest an exodus is imminent, while they were in place one could reasonably discount the chances of a policy tightening for the tradeable future. Now, who knows, especially as the timing of the announcement in the run-up to G20 is probably not a coincidence. That, at least, appears to have been the reaction of equity and currency markets. Today’s WSJ op-ed from Kevin Warsh underscores that markets will need to contemplate the timeline of policy tightening before too long. 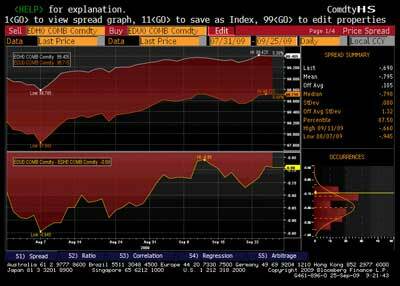 Interestingly, fixed income markets didn’t take the same message….if anything, quite the opposite. The eurodollar curve flattened reasonably yesterday, continuing the trend of the past couple of months (proxied below by the March/Sep 2010 spread.) A eurodollar flattening implies “lower for longer”….not exactly what you’d expect from a market worried about having to contemplate tightening! Alas, logical consistency appears to be too much to ask from this market, as currency punters know all too well. Consider the table below, which lists four countries and some relevant macro variables, and then four six-month currency moves. See if you can match which currency move goes with which country…and no cheating! While Macro Man retains considerable sympathy for the bear case, and has enacted trades to that effect this week, he finds it difficult to fully commit to any thematic view when so many markets exhibit logical inconsistency. So while it’s tempting to have a real go from the short side and shoot for the stars, Macro Man will need to see more than two days of price action to convince him that this is the “big ‘un.” For now, therefore, he’s happy to just aim for Ursus Minor.